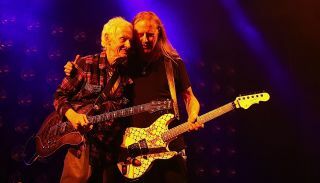 The Doors guitarist joined Alice in Chains at their show at the Hollywood Palladium. On October 23, Eagle Rock Entertainment will release a remastered version of The Doors' July 5, 1968, performance at the Hollywood Bowl. On the 40th anniversary of L.A. Woman, the Doors’ Robby Krieger tells the stories behind some of the album’s greatest cuts. Robby Krieger’s tells how his love of Miles Davis inspired his new album, Singularity. Only 150 of the replicas will be produced. Robby Krieger delves deep inside the Doors’ 1997 box set, telling Guitar World previously untold tales of unreleased live recordings, B-sides and other rarities. Doors guitarist Robby Krieger takes a look back at the unique sound he helped create for Guitar World.